This diagram shows one-dimensional nanowires converting waste heat to electricity. Image: University of Warwick. Waste heat can be converted to electricity more efficiently using one-dimensional nanoscale materials as thin as an atom – ushering in a new way of generating sustainable energy – thanks to new research by scientists at the University of Warwick in the UK. Led by Andrij Vasylenko, Samuel Marks, Jeremy Sloan and David Quigley from Warwick's Department of Physics, in collaboration with colleagues at the universities of Cambridge and Birmingham in the UK, the scientists have found that the most effective thermoelectric materials can be realized by shaping them into the thinnest possible nanowires. Thermoelectric materials harvest waste heat and convert it into electricity – and are much sought-after as renewable and environmentally friendly sources of energy. "In contrast to three-dimensional material, isolated nanowires conduct less heat and more electricity at the same time," said Vasylenko, first author of a paper on this work in ACS Nano. "These unique properties yield unprecedented efficiency of heat-to-electricity conversion in one-dimensional materials." 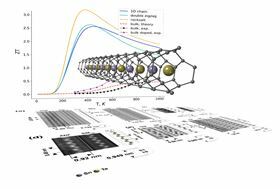 The scientists, which included the group of Andrew Morris from the University of Birmingham, were investigating the crystallization of tin telluride in extremely narrow carbon nanotubes. The nanotubes act as templates for the formation of tin telluride nanowires in their lowest dimensional form. In combined theoretical-experimental research, the scientists were able to establish a direct dependence between the size of a template and the resulting structure of the nanowire. They also demonstrated how this technique can be used for regulating the thermoelectric efficiency of tin telluride formed into nanowires 1–2 atoms in diameter. Vasylenko is excited about what this research could lead to: "This opens up an opportunity for creation of a new generation of thermoelectric generators, but also for exploration of alternative candidate materials for thermoelectrics among abundant and non-toxic chemical elements." With a growing demand for both miniatuarization and enhanced efficiency of thermoelectrics, nanostructuring offers a viable route for targeting both objectives.